Immerse yourself in the rugged beauty of Bryce Canyon, Grand Teton and Yellowstone national parks on this 7-day camping adventure from Las Vegas! See wildlife including bears, bison and wolves, and go on extended hikes and learn about the geologic forces that have created the rock formations and volcanic features you encounter. You'll also tour Salt Lake City's famous Mormon Tabernacle and the Provo River region. Enjoy 5 nights of camping and 1 night of hotel accommodations, as well as almost all meals during your journey (additional charge applies). This small-group tour is limited to 14 people for a more relaxed and intimate experience. 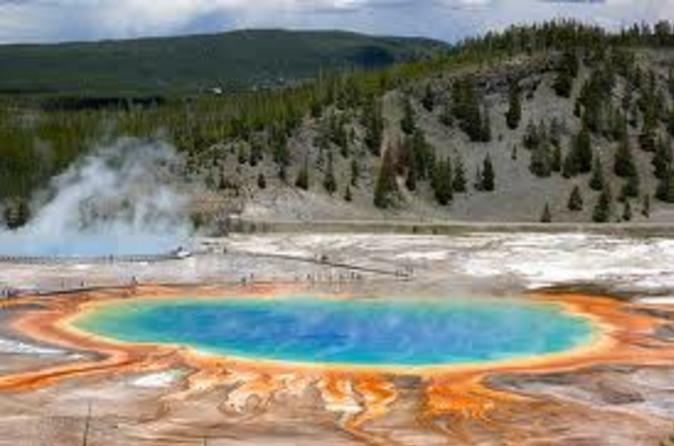 Travel to Utah, Wyoming and Montana to see famous national parks and Salt Lake City, Snow Canyon and the Rocky Mountains on this 7-day adventure from Las Vegas. You'll have plenty of opportunities to hike, spot wildlife and capture amazing photos. Enjoy 5 nights of camping and 1 night in a hotel on this action-packed exploration of America's Wild West. See Itinerary below for details on each day of the tour.